Marcher à Lakeside Beach et Crowbush Cove Golf Que pourriez-vous plus? Aimez-vous la plage puis marchez pendant des kilomètres sur notre belle plage. Golf les liens de Crowbush Cove et avoir le confort de la maison à portée de main. Nous sommes au centre de nombreux terrains de golf, y compris Brudenell et Dundarave, et Eagles View pour n'en nommer que quelques-uns. Venez visiter Lakeside et vous saurez pourquoi nous possédons un chalet si loin. Notre chalet non-fumeur est décoré avec un thème nautique pour vous faire sentir à la plage. Nous sommes adaptés aux enfants avec beaucoup de jouets et de l'espace pour jouer. Si vous aimez le golf, vous pouvez marcher jusqu'à un terrain de golf de classe mondiale à Crowbush Cove et avoir un jeu que vous n'oublierez jamais. Promenez-vous au clair de lune si clair que vous n'aurez pas besoin d'une lampe de poche. Regardez à travers notre télescope et voyez tant d'étoiles que vous ne le croirez pas. Nous sommes à quelques pas de l'une des plus belles plages de l'Île-du-Prince-Édouard. Miles et miles de plage immaculée. Charlottetown est à 20 minutes en voiture. Dans les environs de Morell, vous pouvez faire du kayak ou de la pêche en haute mer. Le chalet dispose d'une douche extérieure pour laver le sable et une véranda de 20 pieds pour échapper à tous les insectes. Il y a un grand pont enveloppant à prendre dans les sites. Non seulement vous avez l'océan à quelques pas, mais aussi un lac d'eau douce. En bas de la route, vous pouvez faire de l'équitation sur la plage et voir un coucher de soleil spectaculaire. Venez chez nous et vous ne voudrez plus jamais partir. I must begin by saying that we had a great stay at Erins cottage. We were 4 adultes, 4 children and 2 dogs, and although we had to use the pullout couch, it did not feel cramped at all. The screened in porch is where we spent so many evenings. The kitchen was very well stocked, with enough utensils and small appliances. The garbage situation did take a little time to comprehend, but once we understood what to do, it just took a little extra time to sort things. The internet however was very slow. It might be due to the fact that we had 3 teens trying to stream/browse content all at once along with us adults checking emails and whatnot. On our first morning, we noticed that the coffee machine did not function properly. After contacting Erin she replaced it extremely quickly... thanks Erin that was very appreciated. The beach is incredible and we did spend a good amount of time there with the kids and dogs. The cottage itself is just secluded enough to not hear the neighbours and enjoy the sounds of all the birds that come by to visit. All in all we had a wonderful stay and would definately come back. Thanks Jennifer, would love to have you back anytime! Yes the internet is very slow and that is considered high speed for PEI Bell Aliant lol. You can stream Netflix but only if everyone else disconnects. Glad you enjoyed the cottage. This cottage has everything and more. 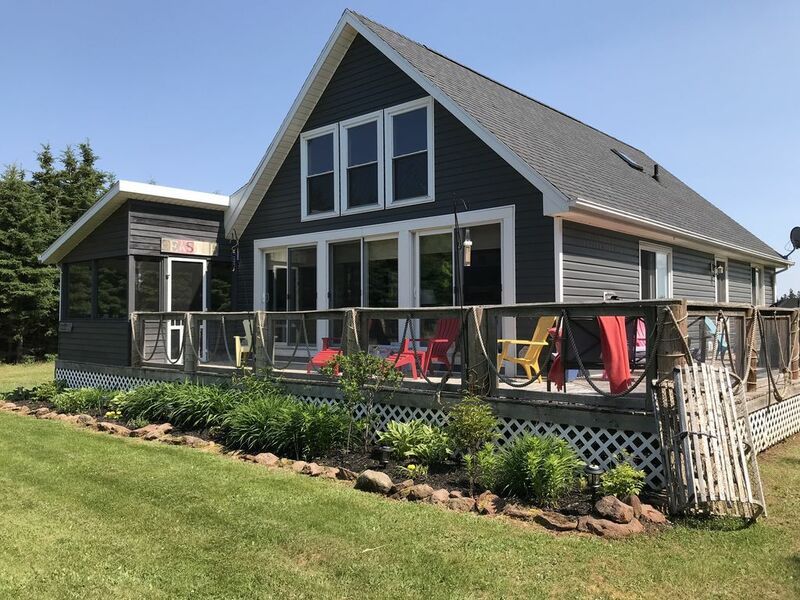 The perfect location to Lakeside Beach and so close to Charlottetown. It is incredibly well equipped through out. The kitchen has every possible item that you would need to cook for a large crowd, including an incredible spice cupboard. You can also grill outside and cook lobsters in a huge stainless pot. The cottage is very quaint, very clean and comfortable. On cooler nights you can warm up to the gas fireplace or fire pit outside to grill smores. Highly recommend. We have rented here three times and have already booked for next year. Very clean, kitchen well-equipped. Loved the deck on 3 sides. Satellite TV, HDMI, and internet great however would have appreciated TSN channels. Quiet, close proximity to beach. It's a beautiful cottage that is close to everything. A short walk to the beach! We loved the time we spent at Erin's cottage! We were two families and it worked out perfectly for us. They had the two rooms downstairs with their two boys and we took the master bedroom upstairs with our infant son. Also, there was a powder room upstairs which was very practical. It's very nice and quiet and a great beach vacation cottage! Thanks Sabrina! Glad you enjoyed the cottage come back anytime. We absolutely loved this cottage. Everything you need is there. It went way beyond my expectations. Such a beautiful spot. I would highly recommend it to anyone. We spent time at this beautiful serene " cottage". The décor is open and peaceful. As soon as I opened the door I smiled!! The sky is huge and the air is clean. The short walk to the beach was quiet and green and then once over the sand dune, it was breathtaking!!! I can not wait to return!! !